K.Z. Bertrand, G. Lindsay, Y. Bar-Yam, Food briefing Aug 24, 2012, NECSI Report 2012-08-02 (8/24/2012). August 15, 2012 - The severe drought in the American Midwest, combined with misguided biofuel policy, threatens to trigger a global catastrophe. The worst U.S. drought since 1956, this summer's high temperatures and lack of rainfall in the breadbasket means this year's corn harvest will be the worst since 1995, the U.S. Department of Agriculture announced on Friday, along with the worst soybean harvest since 2003 . Corn prices have risen 65% since June, while wheat prices have risen 50% from their low this spring . One result is that many hog farmers and cattle ranchers have begun slaughtering their herds early to avoid the skyrocketing costs of grain feed [3,4]. This, in turn, has depressed meat prices, leading President Obama to announce Monday that the Department of Agriculture intends to buy more than $150 million of pork, lamb, chicken and catfish to put a floor under prices . In his weekly radio address, the President — who is currently touring drought-stricken Iowa — described this as "an all-hands-on-deck response" , but he did not mention the government policy that could be changed: ethanol production. U.S. energy legislation requires that 4.9 billion bushels of corn — 46% of a projected harvest of 10.8 billion bushels — be used to produce ethanol for fuel. This mandate — which satisfies only 1% of American energy consumption — diverts corn from food and feed production, driving up prices faster and further than they might have otherwise. They also indirectly inflate the prices of substitutes, primarily wheat but also rice. There are signs this is happening: The Wall Street Journal reported Monday that rice prices are expected to rise 10% over the next three months because of tightening supplies . While the higher costs of grains will be felt by Americans (the U.S. Department of Agriculture projects a 3-4% rise in food prices next year ), the situation is direr for the developing world, particularly in Africa and parts of South America. The United States remains the largest grain exporter in the world , and when U.S. supply goes down, everyone's prices go up. Those living in the “bottom billion”  on less than a dollar per day already spend most of this income on staples , such as corn and rice to survive. When prices soar, they starve. The United Nations estimates 925 million people suffered from chronic hunger at the end of 2010 , a period of relatively low prices. That number will surely rise. In times of food crises, starving people take to the streets. Hunger leads to desperation, and desperation to violence. 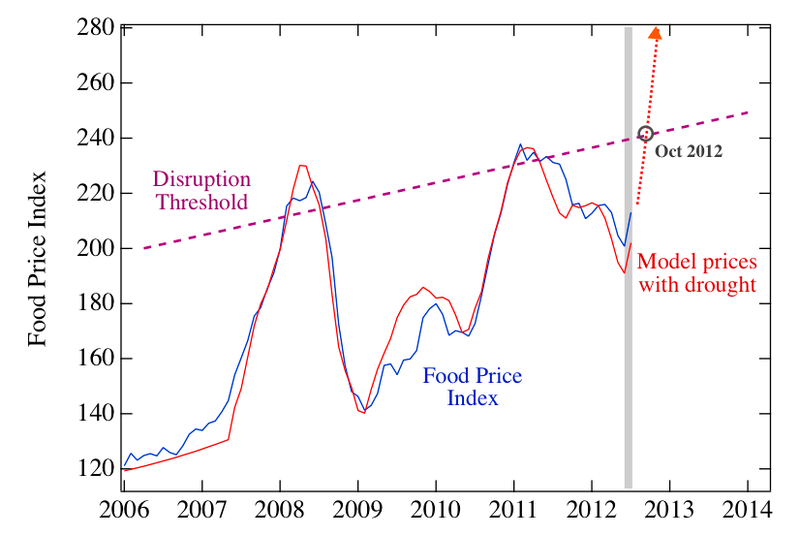 NECSI has shown that surges in unrest coincide with food price peaks in 2007-01 and 2010-11 . Violence, social unrest, political upheaval, and human suffering are inevitable if we do not take steps to control prices. This power is within the U.S. Government's grasp. The Environmental Protection Agency possesses the ability to curtail or even suspend the conversion of corn to ethanol , which it so far has declined to use. Last week, 25 U.S. Senators sent a letter to EPA Administrator Lisa Jackson urging her to exercise her waiver authority , following a letter from 156 Congressmen on Aug. 1 . Last Thursday, José Graziano da Silva, the head of the United Nations Food and Agricultural Organization (FAO), joined them in calling for an “immediate, temporary suspension” of the mandate, which could help head off a food crisis . U.S. Secretary of Agriculture Tom Vilsack has said he "gets down on [his] knees every day" and prays for rain. "If I had [...] a rain dance I could do, I would do it,” Vilsack said . Even if it comes, rain is no longer a solution. A better one would be to suspend the ethanol mandate, which should immediately drive down the prices of staple foods. The corn used for ethanol is the same used for animal feed as well as for many processed foods , and can provide food for many people. We cannot avert the drought, but we can eliminate the mandates, and diminish the food crisis. 12. P. Collier, The bottom billion: Why the poorest countries are failing and what can be done about it (New York: Oxford University Press, 2007). Food prices (blue) and food price model (red) including projected increases in coming months. The social unrest threshold, corrected for inflation (purple dashed line) is a level of food prices that is likely to cause food riots of impoverished populations and social disruption. Parameters as in July update, modified to include larger recent reported FAO food price index increase of 6%.